Flipping through Christopher Lloyd’s The Story of the World in 100 Species (2016), I came across a classic mad scientist image: glass specimen jars, books, a microscope, test tubes and at the centre the scientist, sleeves rolled up above the elbows, wielding a pipette and engrossed in the all-important experiment of the moment. The difference? The scientist pictured was a woman. Whoa! Most brilliant? Why hadn’t I heard of her? And, with the current push around everything STEM, particularly for girls… again, why hadn’t I heard of her? An internet search swiftly revealed her 1995 appearance on the BBC television production Seven Wonders of the World. I was immediately captivated by her warmth, humour, intellect and enthusiasm. She began collecting ladybirds and beetles, she reports, at the age of four, and her first pet was a quail, which she took to bed with her. 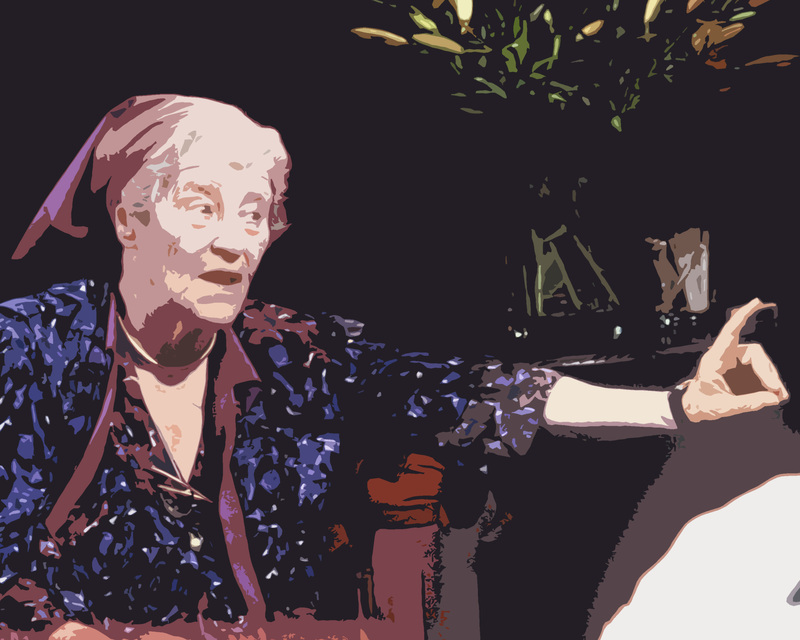 She is in her mid-80s at the time of this interview: alert, amused, decked out in a purple Liberty silk frock and headscarf, with a butterfly specimen pinned to the arm of her sofa. Watching the footage of this keen and mischievous woman, I had no difficulty picturing the engaged and precocious child she once was. And the reason for her inclusion in the Lloyd book? British-born Miriam was the first person to work out the jumping mechanism of the flea (which, incidentally, is from the knee). She found that fleas could jump 30,000 times without stopping, and that flea acceleration is 140-g or twenty times that of a rocket re-entering earth’s atmosphere. It is a testament to her relentless persistence that, in order to work out flea musculature, Miriam cut and examined approximately 6,000 flea serial sections, an undertaking she describes in the interview with comic understatement as ‘quite a job’. ‘The whole of nature is so marvellous,’ she says, and her eyes sparkle. The more I discovered about Miriam Rothschild, the more hooked I became. A tyrant behind the microscope, she had no formal training and her interests were eclectic to say the least. She worked at the decryption centre at Bletchley Park, receiving a Government Defence Medal for her efforts. She opened her Northamptonshire home to wounded soldiers and refugees, and pressured the British government to aid refugee Jewish scientists. She was a qualified dairymaid and ran a pedigree Jersey herd for many years. Although she had inherited wealth, her estate was a working and profitable farm and Miriam’s scientific pursuits were self-funded. During the war she discovered that pigeons with darker plumage were not migrants from outside England, but were in fact suffering from tuberculosis of the adrenal glands. She developed an interest in marine biology and cultivated chicken food made from seaweed. In 1954 she served on a government Advisory Committee on myxomatosis and, working in collaboration at Oxford, identified that the virus was not vectored by mosquitoes, as previously thought, but by the rabbit flea. Miriam campaigned for a variety of causes including animal welfare, conservation, the legalisation of homosexuality, free milk in schools and the introduction of car seatbelts. She was a fine sportsperson, attaining international standards in cricket and squash. In 1962 she founded the Schizophrenia Research Fund. Miriam was the first female president of the Royal Entomological Society. She served on a variety of conservation committees including the Royal Society for Nature Conservation and the Royal Society of Wildlife Trusts, and could often be seen roaming the laneways near her home in her flowing purple silks and short white Wellingtons, scattering wildflower seeds into the verges. In 1982 she met and began corresponding with the Prince of Wales on the subject of increased floral diversity in the countryside. Prince Charles later used her seeds, a mixture she cheekily called “Farmer’s Nightmare,” to develop several hectares of wildflower meadow at Highgrove. In 2000, Miriam was made a Dame of the British Empire for services to Nature Conservation and Biochemical Research. During her lifetime she published over 300 scientific papers and authored or co-authored eleven books. Her first book, co-written with Theresa Clay, Fleas, Flukes, and Cuckoos: a study of bird parasites (1952) is considered by many to be one of the two finest natural history books ever written (the other is EB Ford’s Butterflies). Despite wearing her lack of formal education as something of a badge of honour, she received honorary doctorates from eight universities, including Oxford and Cambridge. A woman of curiosity, courage, determination and heart, Dame Miriam Rothschild was indeed one of the most brilliant naturalists of the 20th century. Undeniably a great role model for girls and women, it will nevertheless be to all our benefit if she becomes a household name. What a fascinating woman she must have been. Reading Suzanne’s words, which really brought her to life, made me wish I could have met her. While we don’t share an interest in fleas, we certainly share a love of purple! This entry was posted in Culture, Opinion and tagged Culture, history, stem, women in STEM. Bookmark the permalink.